The following conversations took place on Facebook, starting about noon, Sunday, December 22, after a big snowfall. Actually it’s several conversations. Resident #1 (Ann Marie Hughes), about noon: So, first big snowfall in Madison for me. When do they plow? I've lived in bigger cities and smaller ones and I've never experienced such disregard for the roads by the government before. I have some important appointments that weren't cancelled, is there any chance, you think, of the roads being plowed today? Mary Mullen (MM), about 1 pm: I would have expected our main roads to have been plowed by now, but I just heard that Seminole Highway wasn't even plowed. Usually we get plowed by the afternoon of a big snowfall, but when we had a much bigger snowfall last year at this time, some more out-of-the-way residential streets like Britta Drive weren't plowed for several days, and even the snowplow got stuck. I would suggest that you contact our alder, Maurice Cheeks, 608-620-1994 or <district10@cityofmadison.com> or become his friend on FaceBook. If you do get a response from him, please let us all know what you learn. Thanks. Thanks for bringing this to my attention Mary. Residential streets that are not salted are only plowed when snow accumulations reach the 3" level AND the snow event has ended or has just about concluded. I don't know if they have made that call yet - but once they do, a full scale plowing of all 1708 lane miles of streets begins. This usually takes between 10-12 hours to complete. Alder Maurice Cheeks, about 2 pm: Ann, I hope you make it safety to your appointments. As Mary said, feel free to reach out to me directly if you need to. Cheers! Resident #1, about 2 pm: I'm on Sheffield, and Britta has a bus, so I guess I shouldn't expect much. So far, nothing. I should peek out and see if they did Seminole. I only heard something truck like once today. Resident#1, about 3 pm: Looks like Seminole was plowed, if that's helpful to anyone. I am now really curious about the process about what roads they deal with after the primary roads are done, what neighborhoods, do they work overtime or call it quits after a shift and so on. Is it distance from the city center? The influence of the neighborhood? Squeaky wheels? Is there one central location for all the plows, or different garages and each area has their own? I know that doesn't change anything, but I'm always curious about the routine and decision making process of the places I live. The web page for snow removal is a wee bit helpful, but rather vague on the progress of residential streets. Resident #1, about 3 pm: Also, this probably looks like a bunch of negativity, so I thought I would add that we absolutely love it here, love the neighborhood, and we are thrilled that we moved here! It's a great place to live. Resident #1 , abour 4 pm: "Just looked, Sheffield is plowed!" DMNA, about 6 pm: Yeah! Non-resident, about 6 pm: Knowing the way local government has been starved since our new governor was elected, cuts have been made, meaning less money for snow removal and overtime pay for snowplow drivers. In my area of the state I've heard that changes have been made due to cuts. The roads aren't taken care of like they used to be. Not sure if any changes have been made in Madison though. Resident #1, about 8 pm: Yeah, that governor made me a wee bit reluctant to move here, but the city was just too much of a draw, figured I could cope until the next election. Not sure how much state cuts would impact city workers. I have a lot to learn. Non-resident #2: Whitney Way was plowed at 7AM. One of the benefits of living on a busy road. Mary Mullen (MM): Milford Road [where I live] was plowed at 3:15 this afternoon. I saw Seminole was well-plowed about 2:15, so maybe the report that it wasn't plowed was either a false report or was from MUCH earlier. I didn't actually go down to check if Seminole was plowed. The Whenona/Crawford route was plowed this morning. Resident #2 : ­­­______ called me at 1:30. Seminole was not plowed at that time. In fact, she said Danbury wasn't either. MM: Thanks for the info, _____. Resident #2, about 6 p.m.: Yep no problem and this guy that plowed our streets wasn't very good either, went up one side once and down our side twice which is good for us but need to keep both sides plowed for parking reasons. Neighborhood businenessman, about 6 pm: Roads all the way to GreenBay are clear and driveable. My wife, son & his wife and friends are at the game. The national government may be stuck in partisan conflict, but the the Dunn’s Marsh Neighborhood Council is not. We are an ambitious bunch that at the December meeting established SEVEN committees to carry out the work of the Neighborhood Association during the coming year. Still, without your help, our grand ideas probably won’t get done. 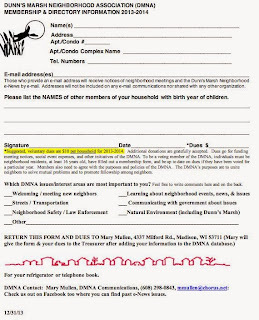 Even if you have never before volunteered in this or another neighborhood, your input and volunteer time will be very valuable in making Dunn’s Marsh the best neighborhood in the world to live in. The bonus is the satisfaction you will feel and the friendships you will make. Each committee has a convener, the person who calls and chairs the first meeting. We ask that you - yes, YOU - consider joining one or more of these committees. Each will meet sometime before the Februay 6 Council meeting. For each topic you are interested in, please contact the listed person who will convene the first committee meeting. 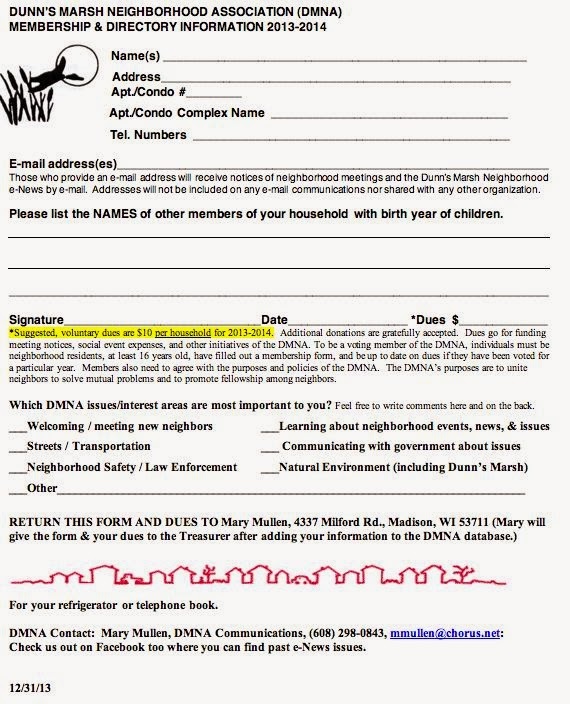 The next DMNA Council meeting will be held at 7 pm, Thursday, January 8, at 2010 Whenona Drive (Prairie UU Society). Residents as well as Council members are welcome, although only Council members can vote on motions. Routine business is planned for this meeting. Residents planning to attend and who want the Council to take up a specific topic should contact Vice President Deacon Tony Williams to discuss that topic. E-mail him at adwilliams043@gmail.com <mailto:adwilliams043@gmail.com> or call him at 608-398-8798. You must punch in the area code to call Deacon Tony. The DMNA Council meets the second Thursday of each month at Prairie. Mosaic artist Marcia Yapp, who is working with the Dunn’s Marsh Community to develop ideas for a mosaic that will go along the path to the bike/ped overpass of the Beltline, would very much like to hear from more people in the neighborhood. The “.doc” survey will allow you to expand your remarks on a chart where Marcia would like to know your favorite places in the neighborhood, the colors and feelings you associate with those places, and the associated visual images. Marcia also would like to know what you feel are the strengths and challenges of this neighborhood, what gives you a sense of pride in our neighborhood, what you would like to communicate to those outside the neighborhood, and what makes you feel connected to the neighborhood. looked like from the air 43 years ago. 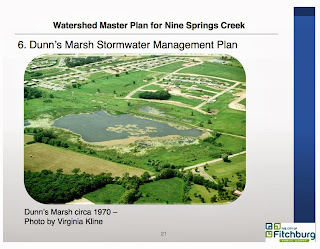 Wonder or not, I’m sure you will be fascinated to see the aerial photo that was part of the PowerPoint presentation for the Watershed Master Plan for Nine Springs Creek. · The Belmar streets - Jenewein, Sentinel Pass, Aztec Trail, Pawnee Pass, and Crescent - are laid out between Apache and Red Arrow, but only a few homes are built. · Crescent Road only extends from Apache to Red Arrow Trail and has no houses, apartments, or condos built on it. · Although the roller rink - then a bowling alley - is at the top of the picture, there’s just a hayfield to the south between it and Jenewein Road. · No buildings at all lie west of Red Arrow Trail until the lines of apartments in the Allied subdivision. 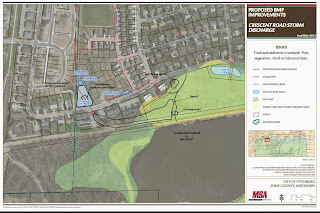 The Nine Springs Creek Watershed Master Plan includes several proposed BMP (best management practice) improvements in the area both north and south of Cresent Road in the vicinity of Red Arrow Trail. 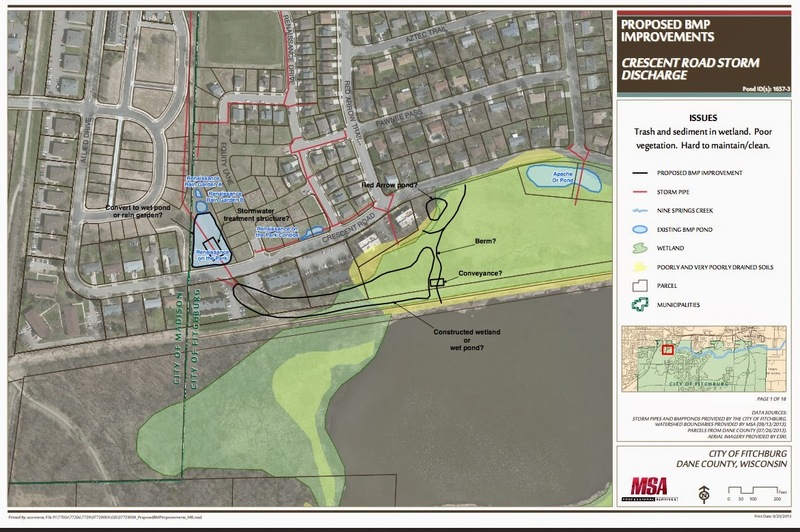 “North marsh proposals.jpg” is a map that shows these suggested modifications. 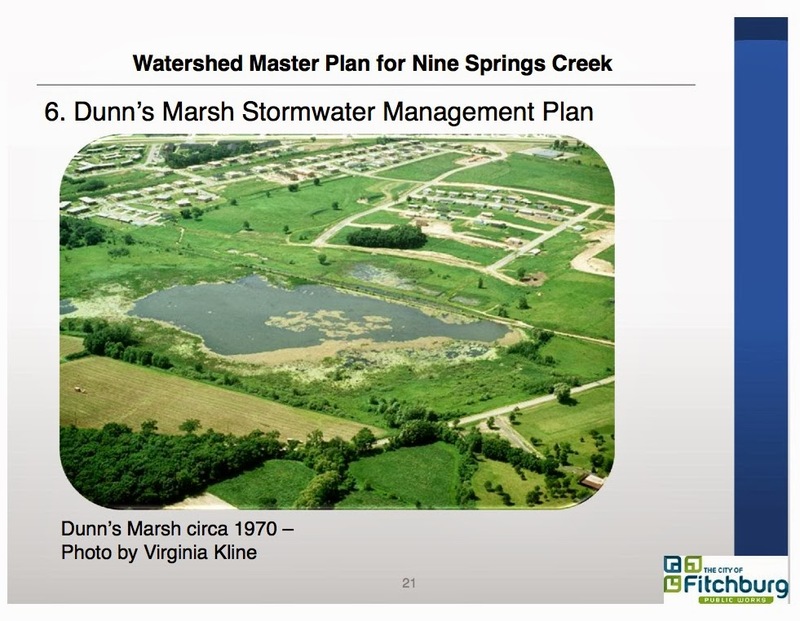 If you are interested in these improvements or marsh water quality, you’ll also want to join the Natural Environment Committee of the Dunn’s Marsh Neighborhoood Association. Madison voters in the neighborhood will be voting at a different location starting with the February 8 election. The new location is right at the corner of the Verona frontage road and Red Arrow Trail, right across Red Arrow from the MacDonald’s parking lot. You have to go a long way back to remember when this was a Pizza Hut. The old location is the HeadStart building just up the hill from MacDonald’s (but on the other side of Red Arrow Trail. The new location is right at the corner of the Verona frontage road and Red Arrow Trail, right across Red Arrow from the MacDonald’s parking lot. You have to go a long way back to remember when this was a Pizza Hut. Fitchburg voters cast their ballots at Fitchburg Fire Station #2 on King James Way, a mile or so from the Dunn’s Marsh Neighborhood. This location has not changed. 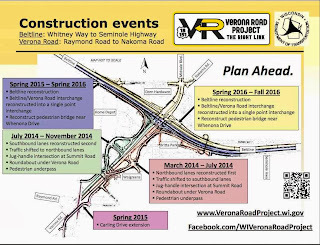 Although weekly construction updates related to the Verona Road project have ceased as of the December 13, 2013 final update, some work was still proceeding. Below are some excerpts from the final report. 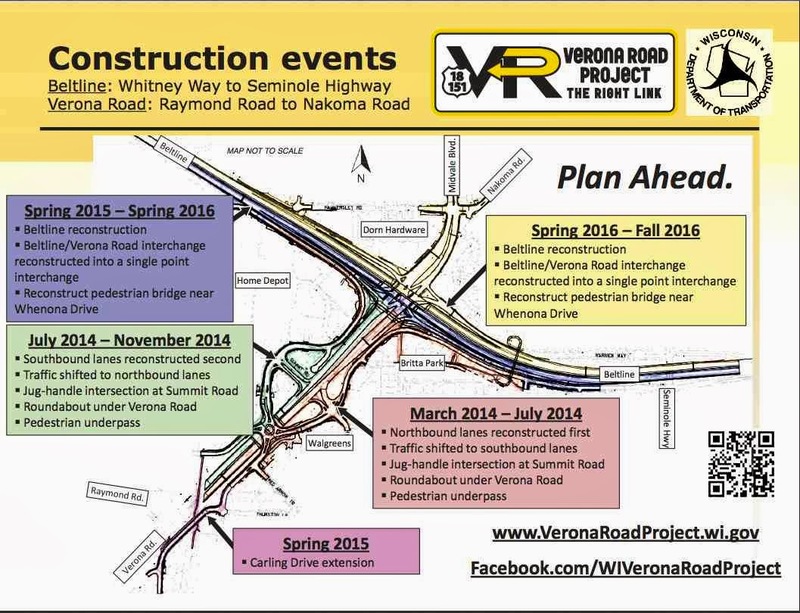 Work along Verona west frontage roads will continue through December. Work will occur off the roadway with minimal traffic impacts, associated with trucking. Building demolition will begin in mid-December on the apartments along the east side of Midvale Boulevard, just north of the westbound Beltline off ramp. Work will occur off the roadway with minimal traffic impacts, associated with trucking. Completion pending installation of permanent traffic signals. Anticipated in January 2014. Stay involved and informed with the project website and project Facebook page <http://lists.wi.gov/t/882914/1837417/3202/0/ <http://lists.wi.gov/t/882914/1837417/3202/0/> > . Here’s an easy way to see what construction is coming down the line along Verona Road and the Beltline during the coming three years. Click on the attachment to see the 5 different locations where the big road-building machinery will be grinding away. 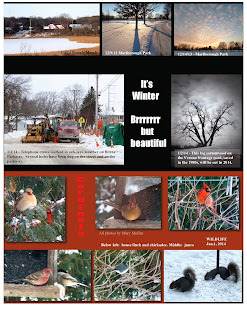 As a few hardy people talked to Wisconsin Department of Transportation folks about Stage 2 of the Verona Road reconstruction project December 19, nature was doing a number outside Fitchburg’s Fire Station #2 on King James Way. Meeting-goers exited the building onto icy sidewalks. They had a lot of scraping to do on their windshields. While all of these locations are beyond the Dunn’s Marsh Neighborhood, people who use businesses adjacent to Verona Road beyond Raymond Road may want to look at the exhibits. They show different alternatives for the County PD instersection with Nesbitt Road/Kapec Road and the WilliamsburgWay/ Anton Drive intersection. The McKee Road alternatives will affect getting onto Nesbitt Road from PD. Nesbitt gives access to the Monkeyshines bar, Jung’s Garden Store, the Fitchburg Veterinarian Hospital, and other businesses. They also affect getting onto Kapec Road from Nesbitt. Kapec is just opposite Nesbittt. All the alternatives prevent crossing PD from Nesbitt to go onto Kapec. Kapec is the road leading to Jamestown Way where Fitchburg Fire Station #2 is. This is where Fitchburg residents in our neighborhood vote. Two alternatives are offered for the Williamsburg Way/Anton Drive intersection - a roundabout or a signal. To see the maps posted as part of the website <http://projects.511wi.gov/web/veronaroad-18-151/ <http://projects.511wi.gov/web/veronaroad-18-151/> >, look for UPDATES [in red type] go to Exhibits. Then scroll down to Stage 2 - Proposed improvements. Click on County PD for those alternative and on Williamsburg Way for the other set. As you look at the PD map, be aware that 18/151 is to the right (east) of what’s shown on the map and the highway runs parallel to Kapec/Nesbitt Road. I believe these changes are several years in the future. Sina Davis, Selena Pettigrew, and others have been working with Allied area residents to promote energy savings and save money for MG&E customers. Here is Sina’s report for outreach work done during the month of December. Met with Ms. Stephanie & Selena on plans to outreach for January, and talked about the video and grant. Talked to Annetta at MGE about upcoming training and door-to-door outreach on saving energy. Outreach at the Holiday Family Night, talking to residents about being part of our Energy Saving Workshop, our upcoming Solar Project, Power Time II Kick-Off Party in January and signing up some residents to be part of the our new projects on Allied Drive. Work on reconnecting with original partners and getting things ready for the Kick Off Party. We have 6 residents ready to start the Energy Saving workshop in January. Outreach door-to-door to residents about The Kick-Off in January, MGE Training, Solar Project. We are to be on the lookout for Allied Allies Cooperative. Covered are 2402, 2406, 2410, 2414, 2418, 2422, 2426, 2430, 2434, 2438, 2442, 2446, 2221, 2230, 2201, 2202, 2210, 2218, 2122, 2118 Allied Drive and 4713, 4702, 4706 Thurston. 2. Fitchburg Holiday Light String Recycling Available (Nov. 25, 2013 to Jan. 30, 2014) – Fitchburg staff and Surplus-IT are teaming up for the second year in a row to offer recycling of holiday light strings for Fitchburg residents. A special cart is available at the Fitchburg City Hall Lobby (5520 Lacy Road, Lobby is available 24 hrs/day) for Fitchburg residents to drop off non-working holiday light strings and extension cords for recycling. Residents must remove any bulbs larger than marble-size and recycle those separately at participating stores. Special thanks go to Lee Shinefield from Surplus-IT for providing recycling of the holiday light strings. 3. Holiday Recycling Guide in English and Spanish – Ever wanted a 1-page handy guide for finding out what types of holiday-related packaging, wrapping, are recyclable? 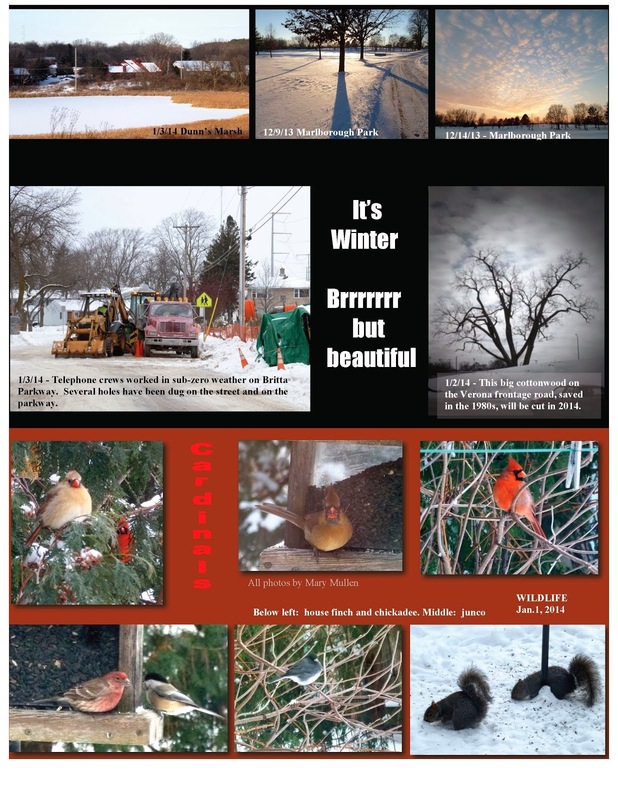 Please visit: http://www.city.fitchburg.wi.us/departments/cityHall/publicWorks/solidWaste/documents/HolidayRecycleListBilingual.pdf <http://www.city.fitchburg.wi.us/departments/cityHall/publicWorks/solidWaste/documents/HolidayRecycleListBilingual.pdf> The second page is in Spanish, with special thanks to Felipe Avila and Vanessa Martinez. We’re currently working on ways to make this available throughout the Latino community, so if you have ideas, please contact felipe.avila@fitchburgwi.gov. We’re also considering translating the full 20-page Fitchburg Recycling Guide and would love to get some help with this. 4. Strong Towns Curbside Chat – January 23, 2014, 6:30pm - City of Fitchburg Public Library – Join Chuck Marohn in an intimate discussion regarding the future of Fitchburg’s neighborhoods. Chuck Marohn is an Engineer and Urban Planner, as well as author of Thoughts on Building Strong Towns, The Strong Towns Blog, and host of The Strong Towns Podcast. For more information on Chuck Marohn and Strong Towns, visit: http://www.strongtowns.org/ <http://www.strongtowns.org/> . 5. City of Fitchburg Water Conservation Campaign – The City of Fitchburg has made water conservation a top priority in 2014 and would like your help. Water conservation saves you money, but also protects our cherished supply of water and decreases energy usage. If we all reduced our indoor and outdoor water usage, we could have a dramatic impact. This winter, join the City of Fitchburg in preparing for Fix a Leak Week March 17-23 and the Wyland Mayor’s Challenge for Water Conservation April 1-30. 6. Fitchburg Green Thursday Event – Yahara Watershed Improvement Network (Yahara WINs) Update - Thurs., Feb. 6, 2014, 6:30pm – Fitchburg Public Library Meeting Rooms A & B - Madison Metropolitan Sewerage District (MMSD) Environmental Specialist Kathy Lake will be on hand to give an update on the great work being done on the Yahara WINs pilot project funded by the City of Fitchburg, MMSD and ~30 additional partners. Visit: http://www.madsewer.org/Programs-Initiatives/Yahara-WINs <http://www.madsewer.org/Programs-Initiatives/Yahara-WINs> for more details. 7. Middleton Green Thursday Event – Water Conservation & Rain Gardens - Thurs., Feb. 6, 2014, 7pm – Willy West Co-Op Community Room, 6825 University Ave., Middleton – Join Middleton staff and Sustainability Committee members in celebrating Middleton's Water Conservation Challenge contestants and winners, share water conservation tips, and hear from a rain garden expert on how to make yards more environmentally friendly. Please feel free to contact me if you have any questions, comments, and/or suggestions on future Green E-News topics. Permaculture is a new way of looking at relating to the environment and growing food. The Madison area is lucky to be a hotbed of activity relating to permaculture including the Madison Area Permaculture Guild. This year the Guild is offering a Permaculture Design Certificate (PDC), with the training “open to anyone and everyone who has an interest in learning more about permaculture.” The 80-hour-plus training is geared to working adults, with one intensive weekend, several Saturdays, and the another intensive weekend. Class starts February 15 & 16 and ends June 7th & 8th. Payment plans are available. Over half of the training hours involve participatory education, hands-on projects and local tours, so students shouldn’t plan on sitting in a classroom for very long! Participatory Education - our collective knowledge of all the students and instructors is greater than any one of us. For more information, and to sign up, either see the website <http://madisonareapermacultureguild.org/pdc-training/ <http://madisonareapermacultureguild.org/pdc-training/> > or contact Jean Schneider, PDC Registration Coordinator, 608-513-0016. Early registration deadline is January 13 and will result in a $50 reduction in the course fee. Registration is open until class is filled. 12 people were turned away last year because the course was full. West Madison Little League (WMLL) has announced the addition of 7-year olds to its spring/summer baseball program for 2014. Players must be 7 years old by April 30, 2014, to qualify. Registration is online at www.wmll.org <http://www.wmll.org/ <http://www.wmll.org/> > starting Jan 4 through Feb 28, 2014. Fees are $15 less for those who register by Feb 2 (Super Bowl Sunday). All 7-year olds will be paired with 8-year olds in WMLL's machine-pitch Atlantic league. WMLL is a 501c3 non-profit organization and our registration period runs from Jan 4 through Feb 28. Calling all qualified, experienced construction workers or individuals pursuing a career in the construction industry to attend an informational recruitment event about job training and work readiness programs offered by WRTP/BIG STEP and The Building Trade Council of South Central Wisconsin. The Building Trade Council represents bricklayers and allied crafts (tile setters), electricians, elevator constructors, heat & frost insulators, iron workers, laborers, operating engineers, operative plasterers and cement masons, painters and allied crafts (painters, drywall finishers, glazers), plumbers, roofers, sheet metal workers, sprinkler fitters and steamfitters. Please pass this information along to all interested parties. Someone is calling people stating they are with Madison Gas and Electric. They inform you your account is past due and you need to pay immediately to avoid disconnect. They want payment with a credit card. This is a scam. DO NOT give any personal information out over the telephone. I contacted Madison Gas and Electric. They are aware of this scam. #1 You should know if you are behind payment with your MG&E account. #2 Madison Gas and Electric will not ask you for credit card payment. They will send you a final notice for a past due account and give you 10 days to work out a payment plan. If you receive telephone calls like this, hang up and contact the police. Fitchburg Police -270-4300, Madison Police - 255-2345. "Sitting is mainly replacing time you spend in daily activity and vice versa," Ekblom-Bak said. A recent study found long periods of sitting actually increased the risk for diabetes , cardiovascular disease and death, she noted.